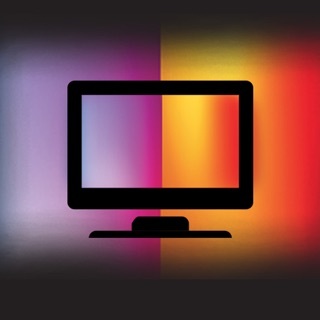 DreamScreen is a TV LED Backlighting kit that enhances TV, Movies, Video Games and Music. By stretching the size of your screen, softening the picture and making TV easier on your eyes, DreamScreen creates an incredibly immersive home theater experience. 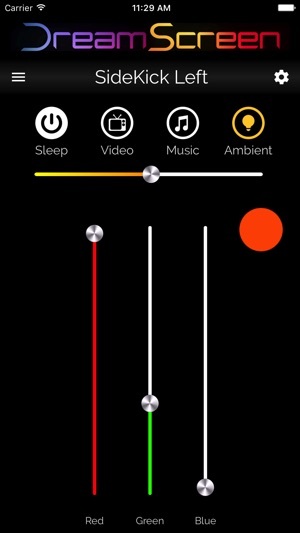 DreamScreen can be enjoyed in Video, Music and Ambient Modes. 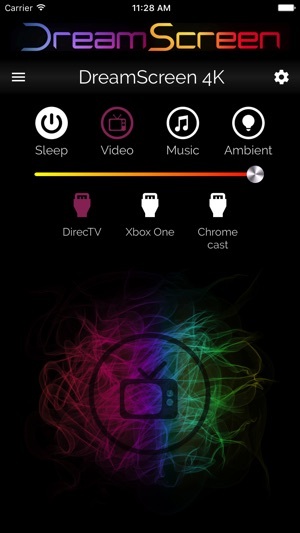 The DreamScreen TV App operates like a remote and offers a full range of control via WiFi. 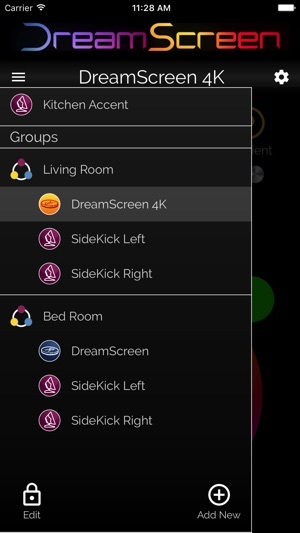 This new DreamScreenTV app allows for control of the new WiFi based DreamScreen HD, DreamScreen 4K and SideKick products. This app update includes new tutorial pages, value texts for all sliders, and bug fixes. In addition, DreamScreen Solo is now supported. 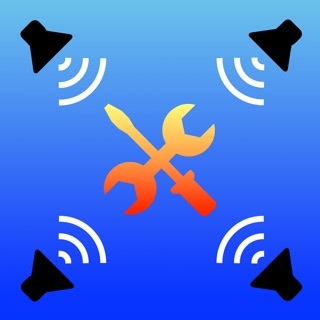 During initial setup, the app has trouble connecting to the wifi hotspot of a newly released Dreamscreen HD, even when all devices are in one room (including wifi router). You have to do several attempts before it finally adds the Dreamscreen device. This was on iPhone 7 and Netgear R7000 router. 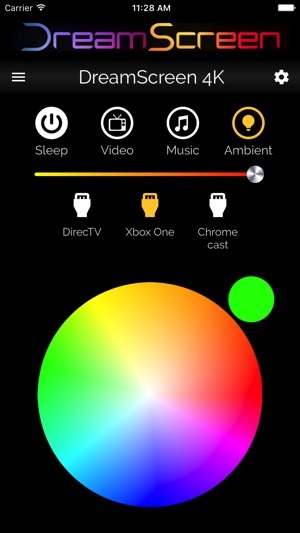 After setup is complete (hopefully) the app would frequently disconnect from Dreamscreen but behave like it's still connected, so you would make changes in the app like color and setting, but they would not be received/saved by Dreamscreen device. The only workaround is to kill the app and open it again. 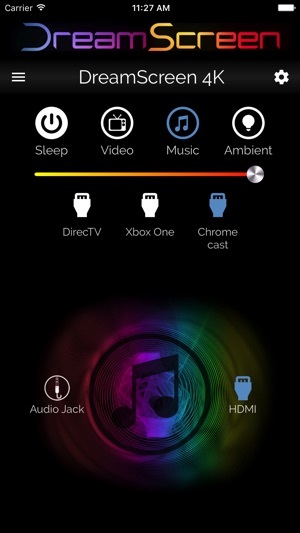 It seems the app cannot hold a connection to the Dreamscreen device for too long and it doesn't know when it loses it. Update: Latest v1.6 version is still having disconnect issues. Sorry for any difficulties you have encountered, but please feel free to contact us through our website for any help and feedback, as we continue to work out any issues like the one you have described. Get used to getting up and switching the module on and off manually. App is garbage. Took 3 hours during initial setup and multiple “tricks” to catch the wifi. If I’m lucky the app can find the device after 20-30 mins of messing with it. My entire home is “smart”, with some of the most powerful equipment money can buy as far as router and modem and top of the line wifi service. Outside of the app being complete junk and in a wireless and tech savvy world this being almost archaic, the product itself is pretty cool when you turn it on. Recc: Buy the product, buy a Fitbit, and track your steps getting up and down turning the piece of junk on and off. Nice concept, in reality - FLOP! This system is completely useless. The instructions that come with the device are “outdated” as they release a new app and expect their customers to know this without communication. After several periodic issues, I reached out to customer service which before attempting to troubleshoot required I replace all HDMI cords. After doing so, they tell me Conveniently that there will be a firmware update released next week. Needed to say, after the “update” and downloading their “new” app having the same issues with this product. I’m requesting a full refund. © DreamScreen, LLC. All Rights Reserved 2015.